Anyone who was lucky enough to read The Aquilifer, the first version of the book now known as “The Immortals’ Legion”, must inevitably have come across these two sentences. They are highly representative of the inner thought of the author, who has been deservedly rewarded by his perseverance, strong will and confidence in life. 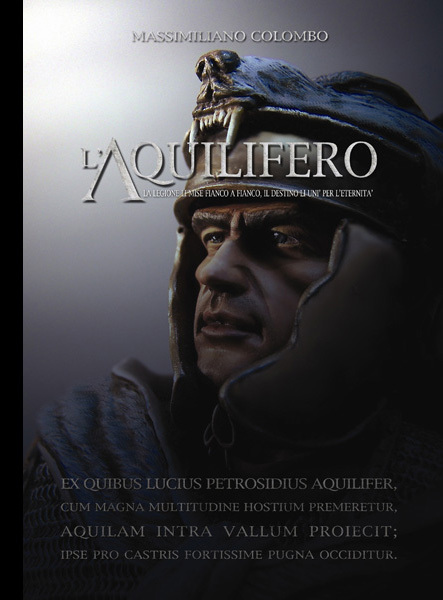 Massimiliano Colombo’s The Aquilifer owes much to Caesar’s De Bello Gallico. Caesar’s pithy style and his famous war chronicle were profoundly inspirational for Massimiliano, who in turn created a crude, tragic and yet engaging story which never fails to astonish its readers for its concreteness. These two stories are strongly linked with each other. Caesar’s De Bello Gallico is a true-to-life, autobiographical war chronicle giving voice to an epic past, and Massimiliano Colombo’s The Aquilifer provides an ideal fulfillment to Caesar’s masterpiece by suggesting new, more personal interpretations of the events and by enriching the original plot. No reader of the De Bello Gallico, as a matter of fact, could prevent themselves from identifying in some of its characters, from feeling their charme, or from feeling repelled by them. And no reader could sit by their stories, their victories, their defeats. Massimiliano Colombo poured all these feelings into his book, which takes the reader through an amazing journey to the extreme sacrifice of a “nine-thousand-lives-lasting day” (Chapter XXVI). And this was only the beginning of a long journey that led Massimiliano Colombo to be recognized as a well-known, successful author, who is certainly going to present his readers with new stories, new beautiful passages, new exciting works.